In AODocs, you can create a library from a template. These are libraries that have been preconfigured to answer a specific use case. Important: Only library creators can create new libraries. This role is defined and managed at the domain level by AODocs super administrators. Learn more: Manage library creators. 1. On the AODocs homepage, press Create library. The Create library page opens. 2. Scroll down to the Library templates section. Select the required template. A library template page opens, with a description of the main features of the library template. You can also access tutorials. 3. Press Create library in the top right corner of the library template page. 4. A pop-up opens. Enter a name for your new library. Your library is now created. For Document Management libraries, you are redirected to the homepage of your library in the AODocs user interface. 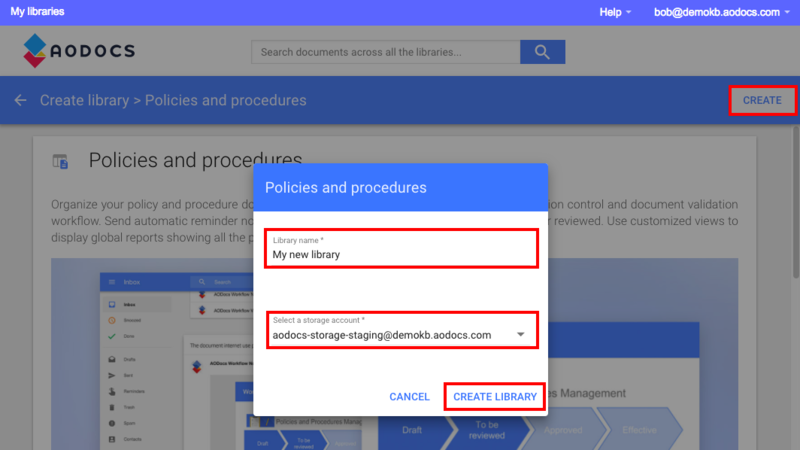 For Team Folder and Secured Folder libraries, you are redirected to the root folder of your library in the Google Drive interface. Once the library is created, the library creator receives an email to confirm that the library has been created. 7. You can now apply permissions and start using your preconfigured library. - The library is shared only with the library creator. - Template documents and attachments are copied from the library template.